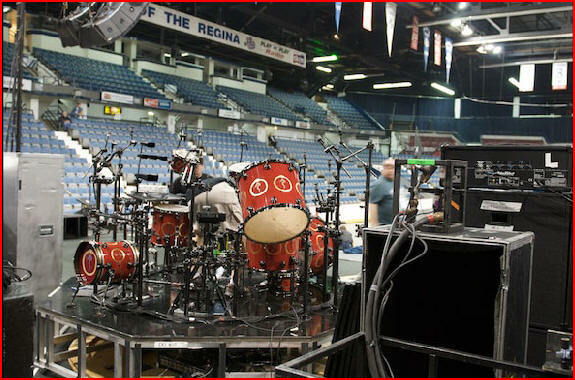 Neil's kit has changed over the years to fit the needs of Rush's music. Since 1996, he seems to be favoring acoustic drums over electronics―although the electronics remain as a satellite kit for live performances. While Neil's kit is large, he's always used the expanded range of voices in interesting ways. On this page, you'll find his latest drum and cymbal setups, as well as the parts list for the 30th Anniversary Kit replicas. Hockey Theme Drum Kit New! The set is airbrushed in Lacquer Graphics with NHL logos and ultra-custom Ice Blue hardware. DW Custom shop Artist, Louie Garcia comments, Neil told me he wanted to begin a new masterpiece with this kit. He really wanted it to represent the game of hockey, incorporating center ice and the face-off circles. And for the look of ice, we with went with a pearlescent color called Blue Frost. It really is a unique kit"
Globe and Mail article about recording the new theme. More photos of the recording session. Go to this part of Neil Peart drumkits for more information. Go to my Buddy Rich 2008 kit page for all the details on this kit. After the 30th anniversary tour, the guys at Drum Workshop and I agreed that the R30 kit ought to be retired. I felt that way because it had been a true centerpiece of that tour (sitting center stage every night, after all), and I wanted to keep that "specialness." The DW guys, lead by John Good ("the Wood Whisperer"), felt that way because they thought they could do better. In 2006, they built me a “West Coast kit” on which I recorded a few songs for my friend Matt Scannell, as well as Snakes and Arrows. Everybody who heard those drums was blown away by their sound, but John continued to develop his ideas—combining different combinations of laminates for the shells, like his “Vertical Low Timbre” innovations. Just as the West Coast kit had eclipsed the R30 drums in tonality and resonance, these new ones take it to what my teacher, Freddie Gruber, would call “another place.” After I had rehearsed a couple of weeks on the West Coast kit, my drum tech, Lorne “Gump” Wheaton, put up the new ones, and I truly couldn’t believe how different they sounded—how much bigger and warmer. One of these drums is bigger—the 23” bass drum, which is another unique innovation of John Good’s. Back in the 70’s, when Rush were opening shows, I used to be able to go out front and listen to other drummers. I noticed then that 24” bass drums had a particular “kick” (for once the word is apt), but I preferred the playability and dynamics of a 22”. John suspected that the 23” would combine the best of both, and he was right. The “VLT” approach was also applied to the snare drum’s shell, and it was another revelation—the best I have ever played, for both response and sound. The toms are 8”, 10”, 12”, 13”, two 15”, 16”, AND 18”, with DW’s Coated Clear heads. Remo supplies some of the other heads, while the drumsticks are Pro-Mark signature models. 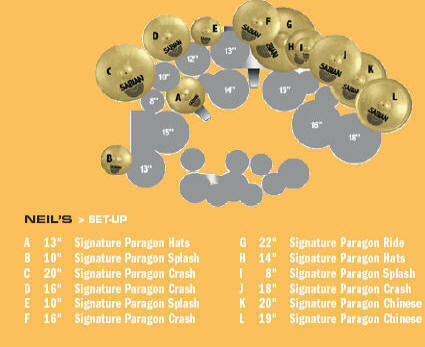 The cymbals are my signature Paragons, by Sabian, with a 22” ride, 20”, 18”, and two 16 crashes, 13” high-hats, 14” “x-hats,”8” and 10” splashes, 19” and 20” China types—plus our new innovation, the “Diamondback,” with tambourine jingles. Neil has a warm-up kit backstage, where he spends 20-30 minutes getting ready for the show. This photo, taken backstage at the Gorge, Washington, has a few interesting details. First, Neil's using the classic DW high-hat stand design, with the flat legs. Note how this stand doesn't fit as closely to his double-bass pedal. Also, he has a basic cymbal set-up, including the new Paragon Diamondback cymbal (instead of a traditional China-type). Finally, the drumsticks do not appear to be the usual Pro-Mark 747s, but a Hot Rod or maybe something new. Other Neil Peart videos are available in the drop-down menu. Note: P is incorrectly labeled in the infographic as a "10" V-drum..." This should be a "Dauz pad." Go to my report on the S.S. Professor tour for tons of details and photos of the 30th Anniversary Kit. The diagram below was taken from the Modern Drummer 9/2002 interview with Neil Peart, which still represents the drum and cymbal sizes, as well as electronic set up. However, for the 30th Anniversary Tour kit, used in 2004, the cymbal brand has now switched to Sabian. The finish of the drums has changed, and the hardware is now gold plated. Neil says of his new kit in the 30th Anniversary Tour Book, "The drums are also brand, spanking new, a special '30th anniversary' kit created for me by the good people at DW. As we worked together on the design, we aimed to create the drum-set equivalent of the 'dream cars' displayed at auto shows, a showpiece that was also the ultimate expression of craftsmanship."